The S520 provides a philosophical shift away from setting numerical mold contamination action levels. 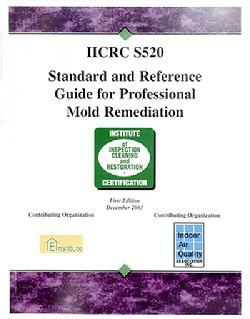 Instead, it establishes mold contamination definitions, descriptions and conditions (1, 2, 3), and general guidance, which, when properly applied, can assist remediators and others in determining criteria that trigger remediation activities or confirm remediation success. Contaminated as the presence of indoor mold growth and/or spores, whose identity, location and amplification are not reflective of a normal fungal ecology for an indoor environment, and which may produce adverse health effects and cause damage to materials, and adversely affect the operation or function of building systems. Condition 1 (normal ecology) � may have settled spores, fungal fragments or traces of actual growth whose identity, location and quantity is reflective of a normal fungal ecology for an indoor environment. Condition 2 (settled spores) � an indoor environment which is primarily contaminated with settled spores that were dispersed directly or indirectly from a Condition 3 area, and which may have traces of actual growth. Condition 3 (actual growth) � an indoor environment contaminated with the presence of actual growth and associated spores. Actual growth includes growth that is active or dormant, visible or hidden. The American National Standards Institute (ANSI) has served in its capacity as administrator and coordinator of the United States private sector voluntary standardization system for more than 90 years. Founded in 1918 by five engineering societies and three government agencies, the Institute remains a private, nonprofit membership organization supported by a diverse constituency of private and public sector organizations. Throughout its history, ANSI has maintained as its primary goal the enhancement of global competitiveness of U.S. business and the American quality of life by promoting and facilitating voluntary consensus standards and conformity assessment systems and promoting their integrity. The Institute represents the interests of its nearly 1,000 company, organization, government agency, institutional and international members through its office in New York City, and its headquarters in Washington, D.C.